The story of the Tarte Tartin gives hope to everyone who is absent-minded in the kitchen. This “accidental” dessert is credited to the sisters Tartin who ran a hotel in the town of Lamotte-Beuvron, in France’s Loire Valley. One of the sisters, Stephanie, was known as an excellent cook but also a bit of a scatterbrain. As the most popular version of the story goes, one day she left the apples for her apple pie in the pan for too long and so they over-caramelised. Not wanting to waste the apples, but wanting to hide the mishap, she covered them with tart pastry and placed the whole pan in the oven to bake. Once cooked, she flipped her concoction back over to serve in order to make it look like a normal tart. If only every kitchen disaster could be such a hit with guests! The great thing about this recipe is that it works just as well with any fruit that caramelises nicely. 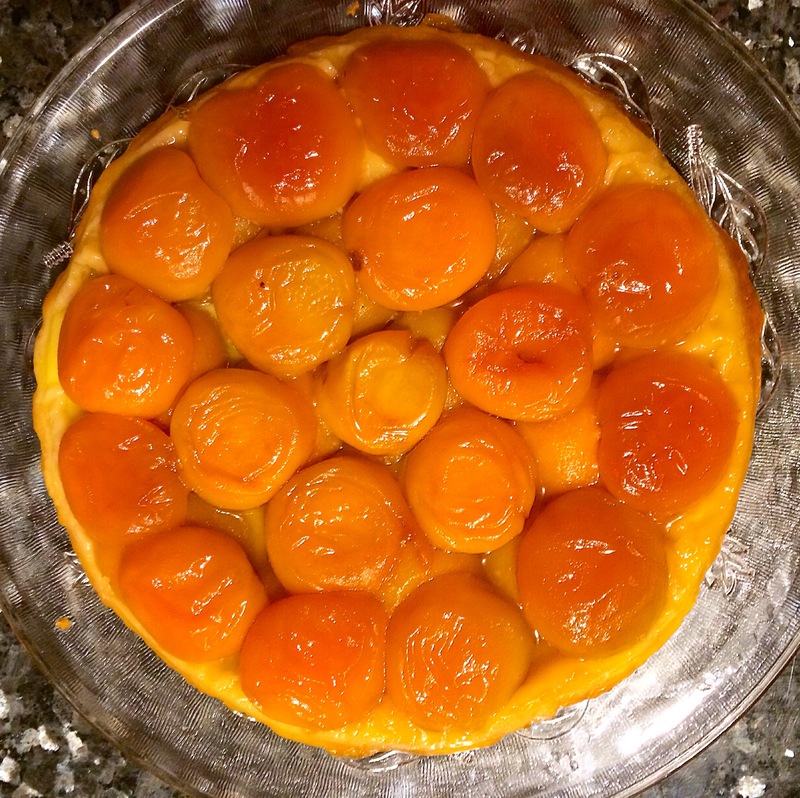 I was lucky enough this summer to have a bumper crop of apricots on my tree and they worked beautifully for this Tarte Tartin. Peaches also work a treat and for the savoury lover, some juicy cherry tomatoes rival their sweeter cousins. Put the sugar and water in a medium sauce pan, give it a stir and cook the sugar until it caramelize. Pour the caramel into a tart dish, glass or non stick is preferable, and make sure it covers the entire base. Cut the apricot in half, remove the stone and place them on top of the caramel cut side towards you. Once you’ve layed down the first layer of apricots, repeat the process once more. When you flip the Tatin you’ll see the nicer side of the apricots. Dice the butter and place it on top of the apricots. Pour the rum on top of the fruit. Place the pastry over the apricots, tuck the sides in and bake for 25 minutes. Once cooked, leave it cool down a little bit then carefully flip it over. A good way to do it is to place a tray on top of the tart and using two towel flip in one move. I suggest you serve the Tarte Tatin with a delicious vanilla bean ice cream and a glass of Chateau “Suduiraut” Sauterne available from http://www.airoldifinewines.com.au .